The closer we get to summer the more I seem to include lighter foods and meals in my menus. My husband loves sea bass. It is a pricier fish so we don't have it that often so it is a real treat when we do. I came across a recipe for sea bass that had lots of fresh ingredients and seemed easy to prepare. 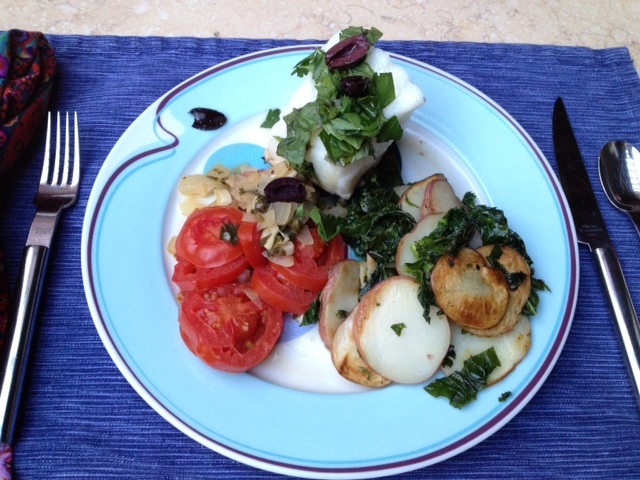 This Mediterranean Striped Bass (315/cal) recipe has basil, plum tomatoes, onion, capers, parsley and olives. It is colorful and flavorful. To complete the meal I made Baby Potatoes with Kale and Garlic (168/cal). The total calories for the meal are 483. This was an especially delicious meal. The sea bass was "melt-in-you-mouth" amazing. We discovered that kale, garlic and potatoes are one of those perfect combinations. This meal is a definite repeat.